Potential for erosion, shoreline damage, flooding, and freezing spray. Environment Canada’s Marine Forecast has issued a Strong Wind Warning for Western Lake Erie. Weather forecasts are calling for winds exceeding 35 km/hr overnight tonight through Wednesday morning. Overnight tonight, winds are expected to be from the east or northeast. Tuesday and Wednesday, winds are expected to be from the west. But the various forecasts do not agree on whether winds on Monday will be transitioning through the north or through the south, in order to arrive in that westerly direction on Tuesday. However, the forecasts are generally in agreement that the winds will remain strong throughout this period. Waves on Lake Erie are forecasted to reach 1.5 to 2 m in height. While winds are out of the northeast, there is the potential for shoreline impacts to the eastern side of Rondeau, including the Rose Beach Line area. There is a risk of erosion, damage to shoreline protection, and backup flooding from the various drain outlets in that stretch. Should the winds transition to the south, winds will be driving waves onto the whole length of our Lake Erie shoreline in Chatham-Kent and Elgin Counties. 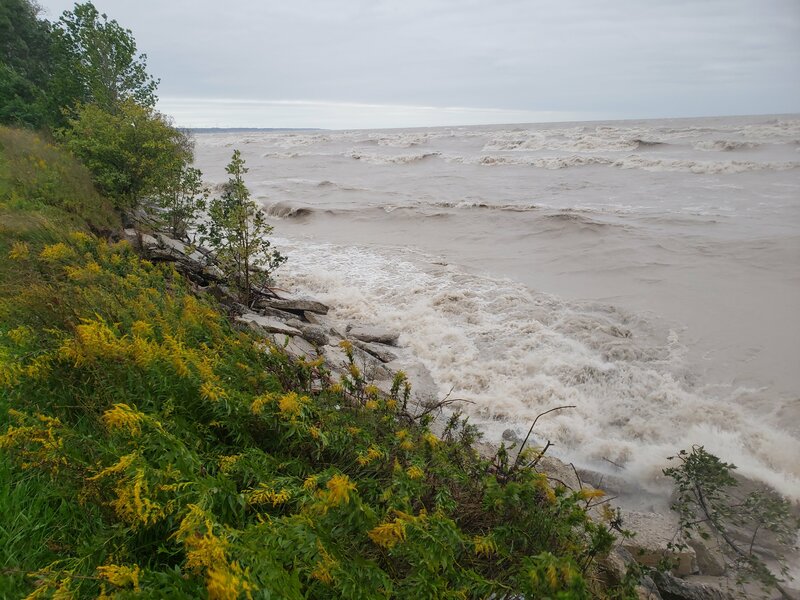 There is a risk that wave action could damage shoreline protection works, cause shoreline erosion, create flooding due to wave crashing against shoreline protection works along Erie Shore Drive, or create backup flooding from the various drain outlets in the Lake Erie shoreline stretch as well. Temperatures are predicted to be below freezing Monday night through Wednesday, and during this period there is a risk that wave spray or floodwaters could freeze creating hazardous conditions. Given the uncertainty around these forecasts, residents along the Lake Erie shoreline should pay close attention to both weather forecasts and current conditions and prepare accordingly. This message will be in effect until November 29, 2018.